A devastating earthquake hit Nepal having magnitude 7.8 April 25, 2015 with epicenter 77 Km North West of capital Kathmandu. Many sites are discussing about earthquake damage, casualties, rescue and future steps to overcome this crisis. We will discuss here rather technical information. We know within earth crust, movement of plates (major or minor) produce strain energy; when the energy becomes large enough to generate rupture, the released strain energy produces earthquake. Since 1988 there have no record of major quake in this region in earthquake history. The region means subduction zone where Eurasia plate is ridding over India plate. These two plates are converging at a rate of (40-50) mm per year. The Nepal-Bihar earthquake (1934) claimed around 10,600 fatalities having magnitude of 8.0. These two earthquake was located 240 Km away from this recent earthquake in Nepal. Though major plates we subducting past each other at major plate boundary in this region, the thrust of such magnitude are rare in history. Only four quakes were recorded having magnitude 6 or more around 250 Km radius of this present epicenter. 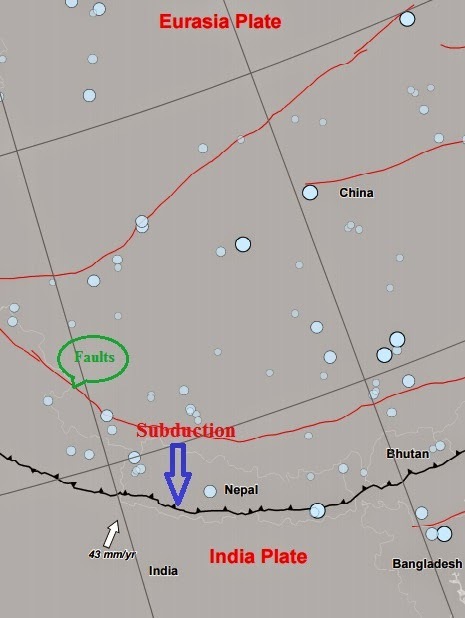 The April 25, 2015 earthquake in Nepal is found compatible with subduction thrust between Eurasia and India plates. This quake was a shallow earthquake and the location was 28.147°N 84.708°E, the intensity measured at Kathmandu VII, Patna V and Dhaka VI.